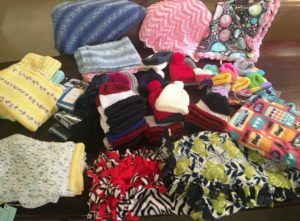 If you have a knitting / crocheting talent and would like to join the TMC in teaming up with CASA, please reach out to us at contact@tmcmch.org. FYI…..Knitting and crocheting are not a requirement to join the fun at TMC! On January 24, 2019, TMC President Carol Schessler welcomed seventy-seven Thursday Morning Club members who gathered to celebrate the Club’s support of the education of children. This event, called the Scholarship Social, and organized by Education Chair Cathy Gotliffe, provides TMC members with the opportunity to meet two of the seven recipients of the scholarships/awards that the Club funds, and to enjoy lunch and games afterwards. 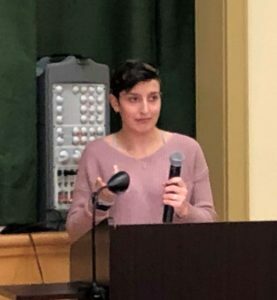 Marisa Papa, currently a Madison High School junior, was sponsored by TMC to attend the 2018 Hugh O’Brian Youth Leadership conference held last June at Kean University. 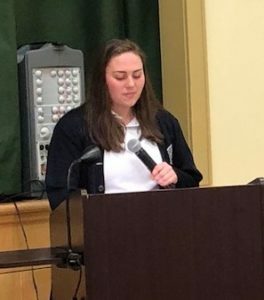 Marisa noted that she “learned a lot about what it means to be a better person and a better member of society.” Marisa was accompanied at the Social by her parents, Nancy and Gina O’Brien, and by Madison High School Director of Guidance Brett Levine. Molly Burke, now a senior at Benedictine Academy in Elizabeth, was sponsored by TMC to attend Girls’ Career Institute in June 2018 at Douglass College. Molly also described her experiences at GCI, and led her audience through one of the short bonding activities that she learned during her time at Douglass College. Molly attended the Social with Benedictine Academy Principal Ashley Powell. We are looking forward to our next General Meeting with our guest speaker Dr. Douglas Simon, emeritus professor of political science at Drew University. At Drew, Simon specialized in international affairs, U.S. foreign policy, international organization, and national security. This is a free lecture open to the public on Thursday February 7, 2019 beginning at 10:00 AM. It will be held at the Madison Community House 25 Cook Ave., Madison. Dr. Simon’s presentation “Global Power Shifts and Implications for American Foreign Policy: An Update by Dr. Douglas Simon” will discuss major shifts of power characterizing the current and future international system. Attention will focus on China’s challenge to American global preeminence, the rise of Eurasia, Russia’s efforts to reestablish its sphere of influence, and the advent of hyper-nationalism and the threat that it brings to the post-WW II international order. As these developments progress, two dangers standout. The first is the danger of war that often occurs when one dominant power seeks to displace another. The second is in the area of weapons proliferation, not only nuclear, chemical and biological weapons of mass destruction, but weapons used in cyberwar. We will be closing out a busy February with our 2nd Wise Wonderful Women of our Lunch & Lecture Series will feature NJ photographer Walter Choroszewski; “CINEMA and Television: The NEW JERSEY Connection” on Thursday February 21, 2019 beginning at 11:30 AM. Lunch will be served by our Catering Dept. 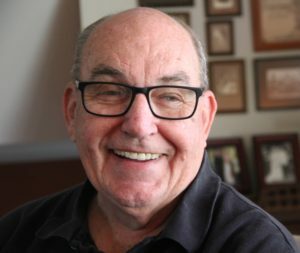 Mr. Choroszewski started his Jersey pride in 1980 when he was commissioned to photograph NJ for a book project. NEW JERSEY A Scenic Discovery, which launched his photographic career and link to the Garden State. Since then he has published 18 other photographic books. His photographs of Jersey are widely published in calendars, magazines and textbooks. His fine art prints and murals of New Jersey are found in corporations and hospitals. 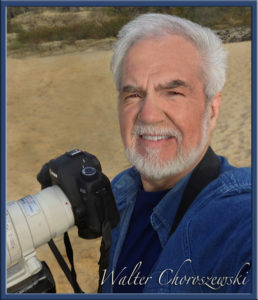 His photographs were the inspiration for creating the iconic state tourism campaign: “NEW JERSEY & You: Perfect Together!” Walter was the primary photographer of the campaign through the 1980s and 90s and was awarded the first New Jersey Photo Journalism Award by Governor Thomas Kean in 1989. Tickets are required and are $35.00/ea. which include a delicious lunch by the TMC Catering Dept. and lecture by Mr. Choroszewski. Please join us for a fun filled afternoon. Stay tuned for what’s ahead in March. 0 Comments on "January and February 2019 Happenings"